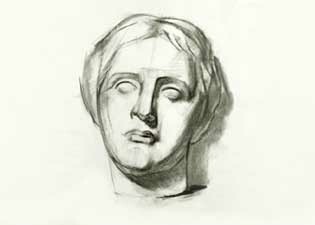 While studying to draw the head, it is easier to start with a copy of a classical sculpture, since you will need a lot of time practicing and it will be hard to convince your friends or relatives to sit still for hours. You can choose from any of the classical sculptures that you can find. 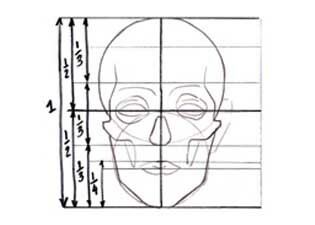 During the first stage of drawing the head pay close attention to the proportions, measure carefully the relations between the sizes of parts of the head. Take time to do it, since the final result will depend on how well you do the first stage. Using the shades, show the forms and the volumes. Notice the small details on the eyes, the mouth etc. A drawing of Venus de Milo from the video.